I think I have—quite simply—found THE perfect leather tote. 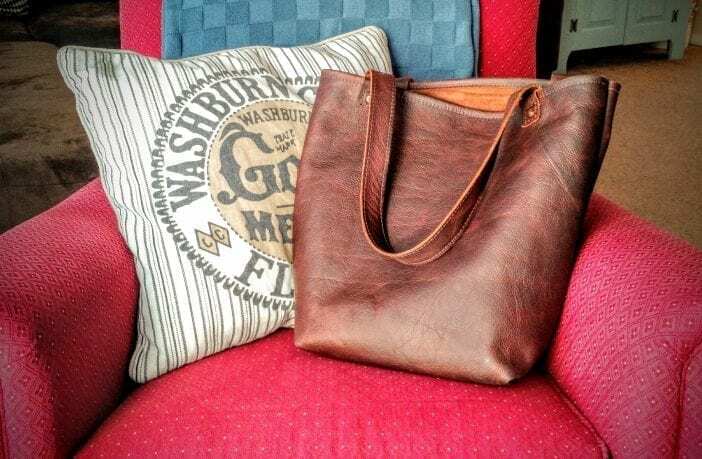 It’s the Addison Tote from Megan’s Mark Leather, and there are so many things I love about it. But first, let me tell you some behind-the-scenes. As a leather blogger, I spoke on the phone with Megan, the creator, before I ordered—wanting to get the inside scoop on the product. She told me she’s always been drawn to leather products with a classic aesthetic and personalized touches to show they were hand-made. She looked for simple design too—no buckles, zippers, or anything superfluous. But “it was hard for me to find my style,” she said, “so I created it.” Luckily, that happened to be the style I was looking for too. First up, let’s talk about the craftsmanship and materials. The tote is made in the U.S., sourced from Tandy Leather. The leather type is called oiled kodiak, and it’s chrome-tanned and medium temper, which gives it rich colors and a little bit of texture. Mine even has some unique scarring, which I like. Megan makes two versions of this tote. The first is simpler and has a straight-cut edge at the top opening. I ordered the upgraded version, which has that top edge turned-down and stitched. And I love the contrast of that finished edge with the raw edges you’ll see on the straps. It really emphasizes the leather as a material and brings the design together in a way that makes it perfect for any occasion. As I said, the leather has some imperfections, making it authentically one-of-a-kind. The stain is rich and warm, while still being perfectly modern. The rivets are a nice, complementary copper color. On a personal note, the bag arrived during the coldest part of winter, and it had lighter marks across it where it was bent. This concerned me, because it didn’t look too great. But when I brought it out of the package and let it relax in the warmth of my home, all the discoloration went away. Now the bag is beautiful, as you’ll see in the photos. Inside the bag, there’s a special treat (at least to any woman who’s previously owned a tote). The inner side features a small pouch, perfect for holding small items you’d rather not have floating at the bottom. It includes a clasp attached to a length of leather to keep your keys secure. It’s a thoughtful design, particularly if you ask my phone screen. In the month and a half I’ve owned it, I’ve found many occasions to make it my companion. It’s a wonderful upgrade to my old shoulder bag and the perfect size for a busy mom—large enough to fit several items, and yet never so large that it’s in the way. On outings with my baby, I slip my small purse inside, along with diapers, wipes, a spare outfit, and treats, topped with her favorite quilt and stuffed kitty—and it all fits wonderfully! I once loaded it full of Christmas packages and waited in line at the post office, and my shoulder felt no fatigue because the leather straps molded comfortably to its shape. I take the tote to church every week, where it fits an 8×11 binder, activities to keep children quiet, and my purse tucked inside. It’s been my car bag on day trips, my gym bag, and my favorite bag. This tote has a unique, simple style that really sets it apart from something you’d find at Target. It’s made from hearty materials and was hand-crafted precisely. And, best of all, it has worked well for every situation I’ve used it in. If these are qualities you’re looking for, the Addison Tote from Megan’s Mark Leather is a great choice. 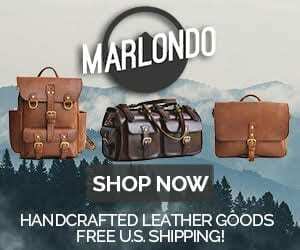 2 Comments on "Megan’s Mark Leather Addison Tote Review — $208"